Sweaty palms, flushed cheeks, adrenaline swelling the veins in your head. Are you with a bunch of teenage friends walking into a deserted cabin in the woods? No, I’m sharing a recent description of how someone felt walking into their performance review! 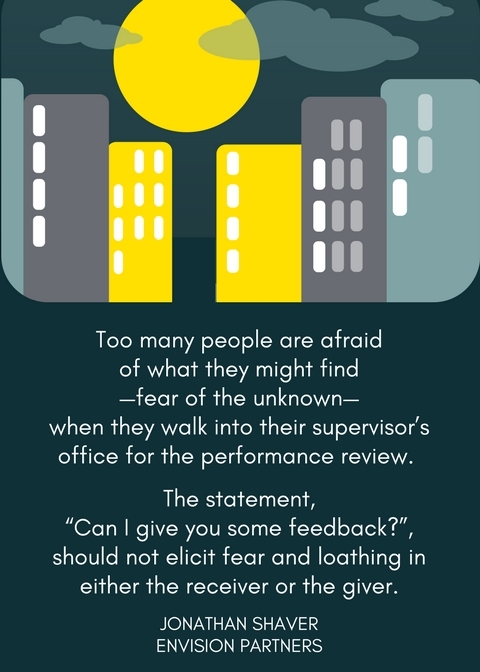 Like walking into a deserted cabin in the woods, too many people are afraid of what they might find—fear of the unknown–when they walk into their supervisor’s office for the performance review. The statement, “Can I give you some feedback?”, should not elicit fear and loathing in either the receiver or the giver. How do we avoid eliciting such fear of the unknown in ourselves or in others? Know the expectations of performance. Imagine one of your team members, as a growth activity, provides a critical presentation with upper management. You are present at the meeting. In your opinion the presentation does not resonate with the upper management (your bosses). Of course, you feel obligated to “give some feedback”. What does your team member fear as they walk into your “cabin in the woods”? If you were not clear about the expectations of that presentation, they fear the unknown. If you were clear about the expectations of that presentation, they may have emotion, but they are well prepared for what is in the “cabin”. Importantly, when expectations are clearly understood, there’s no need to even say, “Can I give you some feedback?”. Your team member will likely already know they did not meet expectations and will come to you. If expectations of performance were not clearly understood, and your perceptions of the performance differed, there’s additional trouble. In this situation, you should be nervous. And the other person will most likely walk away feeling as if the feedback was unfair. Unfair because the expectations were not clear from the beginning. When anyfeedback is given without proper expectations from the start, the feedback is interpreted as “you were pleased or you were dissatisfied”, and your satisfaction is not very useful for maximizing the growth potential of an assignment or improving performance. With clear expectations from the beginning, it’s almost possible to avoid feedback sessions altogether. With clear expectations, it’s easy for each team member to give themselves feedback. Let them come to you with their measure and ask you for help where they want it.